1 baby food jar with lid. Fill with green candy such as M and M''s, Nerds, etc). Other sugestions are small green buttons, shamrock figures or stickers, green beads, small green pom poms, green colored rice. Paint lid of jar green. 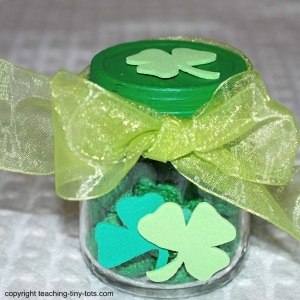 Glue on shamrocks with craft glue. Tie a ribbon or glue some lace arount the lid. Paint the lid while on the jar. Put masking tape around the base so paint doesn't go on the glass. It is easier to apply paint on the lid evenly without getting it on your child's hands. Use paint pens to decorate. A shamrock is a symbol of Ireland. it is a three-leafed old white clover. It is a common way to celebrate St. Patrick's day by wearing a shamrock which is said to bring good luck.